Anxiety: 4 FAQ’s – Causes? Sinful? Friend? Counseling? This post is meant to offer guidance to common “What now?” questions that could emerge from Pastor J.D.’s sermon on Matthew 6:25-34 addressing the subject of anxiety preached at The Summit Church Saturday/Sunday August 18-19, 2018. Why Do Humans Get Anxious In Ways Other Creatures Don’t? Human beings are unique from all other creatures in our ability to experience anxiety at times that do not immediately demand the response of fear or despair. Our twin abilities to anticipate and reflect, which account for the major advancements of civilization, also give these unpleasant emotions a chronic place in our lives. When Satan tempted Eve, he said eating of the tree of the knowledge of good and evil would make them “like God” (Genesis 3:4). He was right, not because Adam and Eve become small deities, but because we gained the partial ability – at least cognitively – to simultaneously live in the past, present, and future. We began to live under the weight of what was, what is, and what might be with only the ability to influence the present. One result of this is that anxiety became a very normal part of the fallen human experience. No longer were we willing to live each moment in contented, trusting reliance upon God. We began to want to know “what we would do if…” some bad thing happened (a non-issue before the Fall) and to be ruled by “what we should have done instead of…” some bad or untimely thing we did (another non-issue before the Fall). In this we see that all anxiety has its roots in sin. That is not to say that all depression-anxiety is the direct consequence of personal sin. Biology, environment, and choice all play a role in our emotions. When Is Anxiety Sinful and When Is It Morally Neutral? How do we know if our anxiety is wrong: an evidence of a lack of faith or the result of valuing-trusting something more than God? There are many experiences of an anxious mood which are clearly not sinful. Suspense over a good book, movie, or close ball game. Anticipating a significant event (e.g., the birth of child). The forethought of unpleasant circumstances that allows for wise planning. The drive of an athlete who channels the possibility of failure into practice. Read Philippians 4:4 and Matthew 5:4. Based upon the non-contradictory nature of Scripture, we must remind ourselves that the command of Philippians 4:4, “Rejoice in the Lord always,” does not negate the decree of Matthew 5:4, “Blessed are those who mourn for they will be comforted.” God does not require that his children perpetually live at the positive end of the emotional spectrum. The command of Philippians 4:4 should be understood in two senses. A warning against allowing unpleasant experiences to rob our capacity for joy. When fear, despair, bitterness, or other unpleasant emotion removes our capacity for joy, we are in spiritual danger. God’s commands are an expression of his concern, not a theistic power trip. When we trust his purpose in giving a command, it gives us freedom from the fear of punishment and, thereby, allows us engage the process of change with an attitude of appreciation instead of compulsion. Beyond saying not all anxiety is sin, we can go so far as to say that some experiences of anxiety-depression are actually good. The capacity for a down mood and the ability to anticipate the future are not simply byproducts of the Fall. These emotions can warn of danger (good), motivate us to change (good), be used to consoled ourselves or others (good), or distract us from God (bad). One way (but not the only way) to see where this line is crossed is to examine how anxiety affects our ability to be effective and productive. 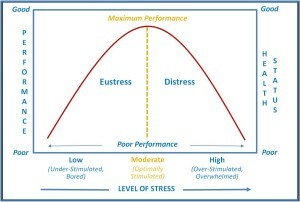 The correlation of our stress level and effectiveness follow a bell curve. The prefix “eu” means “good or beneficial,” so eustress is that level of concern or pressure which enhances our senses and raises our level of performance. We usually use positively connotated words to describe these experiences: anticipation, eagerness, hopefulness, or a phrase like “I can’t wait.” The neurochemicals of these experiences are nearly identical to that of unhealthy anxiety. At some point, which varies from person to person and by subject to subject, this eustress begins to be counter-productive and we call it distress. We should not equate productivity with morality, but we can begin to see more clearly that the capacity for anxiety has the potential to enhance or diminish our quality of life. So now, let’s engage the question directly, “When does anxiety-depression become sinful?” Something becomes sinful when it offends God or violates his design. Therefore, the stronger you answer “yes” to these kinds of questions, the more likely your anxious experience is revealing sin. Does your anxiety come from or cause doubting of God’s goodness? Does your anxiety come from or cause trying to control things that are God’s to determine? Is your anxiety rooted in other sins such as bitterness, greed, jealousy, or discontentment? Is your anxiety rooted in a sense of entitlement or comparing yourself to others? 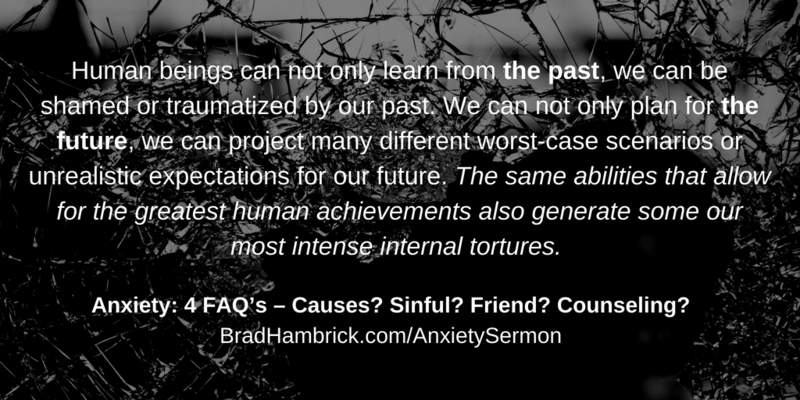 Is your anxiety the result of shame about or a fear of being “found out” for another sin? It is important to distinguish anxiety that is caused by sin from anxiety that results in sin. In the former (questions above), we repent of the emotions themselves, or least what they reveal about us. In the latter (questions below), we repent of how we’ve allowed these emotions to manifest themselves in our life. Does your anxiety result in sins of omission? Does your anxiety result in a sense of helplessness and passivity towards life? Does your anxiety result in destructive habits as a form of escape or self-medication? Does your anxiety result in self-centeredness where it is hard to consider others? Does your anxiety result in pride (e.g., a sense that you’re the exception to what would be helpful)? If I have a friend who struggles with anxiety, how can I be a more effective friend and encourager? Listen well without assuming your “instinctual explanation” of anxiety is accurate. We all have a default explanation for emotional experiences. It may come from our own experience, our “common sense,” or a favorite book. But when you listen do not force your friend’s experience into your assumption. Allow whichever of the causes (likely plural; review the list in question one) that best-fit your friend’s experience to be the cause. Just because something “worked for you” doesn’t mean it will work for your friend. Your presence and care have a powerful impact on removing the isolation and stigma associated with anxiety even if you are not the “advice giver.” Good advice without authentic, personal relationships is limited in its effectiveness. Your role as friend will outlast whatever role a counselor or doctor may play. G4 Group on Anxiety – This is a free, peer support group ministry at Summit that has groups for anxiety and many other life struggles.